I’ve been a fan of Felicia Day since 2008 when I watched her play Penny in Dr. Horrible’s Sing Along Blog. Then a friend told me Day’s own Internet show, The Guild, inspired Joss Whedon to make Dr. Horrible, so I watched all six seasons of this fun show on Netflix. The Guild, written and produced by Felicia Day, is about a group of World of Warcraft-like gamers who end up meeting in person. The group represents the variety of computer gamers that exist—slacker teenagers, bored stay-at-home moms, penny-pinching middle aged men, socially challenged twenty-something guys, and sharp-tongued college students. It’s available to watch instantly on Netflix. I’m also a frequent watcher of Day’s Vaginal Fantasy Romance Book Club on YouTube—where she and four friends discuss speculative fiction and historical romance novels that have a feminist bent. Plus, though I stopped watching Supernatural regularly after season six, I always watched the two Supernatural episodes she appeared in each season, as quirky computer hacker Charlie, . Day writes about her unusual childhood being homeschooled in the south– “for hippy, not Jesus reasons”, how she got a full scholarship to study violin and math at the University of Texas at sixteen, how she built her acting career after deciding she didn’t want to be a professional musician, and how she ended up finding a more fulfilling career on the Internet. Her book was utterly charming and inspiring for me as a writer. Day is very honest about her struggles with perfectionism, procrastination, and her lack of confidence. Her homeschooling childhood is fascinating, but the best parts of the book, for me, were the details of how a writing class, and then a critique group, pressured her into giving up her Internet gaming addiction and take the plunge into writing. Her group then helped her produced her own TV pilot. The details of how The Guild became an Internet success are interesting, funny, messy and so real. Day follows these exciting chapters with several soul-searching chapters on dealing with the pressures of success in an honest reassuring manner. Success is one of my biggest nightmares and so it was especially comforting to read about Day’s struggles and triumphs dealing with her own demons and health issues. Spoiler alert: She even had her own thyroid health problems! The last chapter on Gamegate is a good summary of the nightmarish attack on Internet women. Day is honest about how hesitant she was to speak out about these attacks and why. Her story of what happened when she did finally speak out is harrowing but inspiring. Like other women on the Internet, she’s come to terms with how thick-skinned women need be, and has found her own way to be honest and real with the public, while at the same time protecting herself. It’s reassuring, inspiring stuff! Day reads the audiobook herself, which is like having your coolest friend tell you all about her Hollywood/ Internet adventures while you do the dishes or clean the house. I highly recommend this book for anyone who writes, likes gaming, enjoys popular culture, or just likes a good memoir. This entry was posted in Uncategorized and tagged 5 stars, books, feminism, memoirs, netflix instant, reviews, supernatural, tv, websites by rowenaeureka. Bookmark the permalink. I loved her work on the various Supernatural episodes she appeared in (huge fan of the show still…in fact just did a post a few moments ago on my lifeattitudes site…that’s how I found your review!) as well as Syfy’s Eureka. Obviously Dr. Horrible as well. Saw the book was out and wondered about someone so relatively young (to me anyway!) 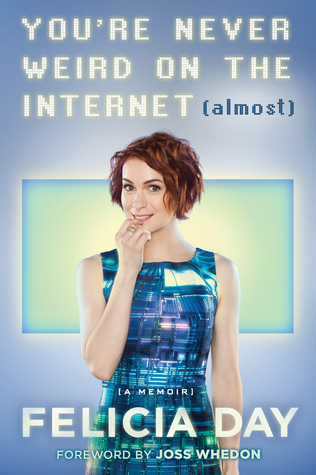 writing a memoir as they’re literally just getting going…but you make a compelling argument for picking up a copy based on her insight into the Internet and its influence both good and not-so-good.